Apple is having its well deserved success among enterprises and corporations alike, some say without even having a dedicated salesforce, but apparently that doesn't stop the company from discussing iOS devices and Macs with interested business users in the so-called Briefing Rooms. What's a Briefing Room, you ask? 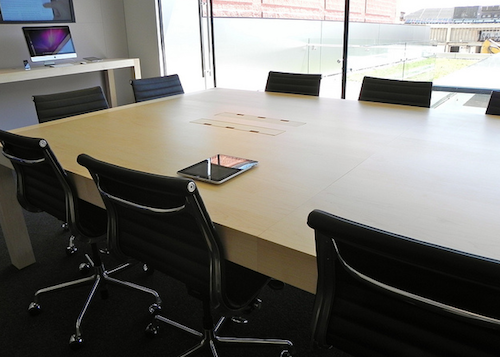 It's a super-exclusive conference room that comes with high-end Mac gear, iPhone and iPad-controlled presentation monitors, large glass windows and lots of iPads on the table. The Briefing Room is typically located inside an Apple Store, but away from the chaotic showroom where consumers check out the latest iPhones and Mac accessories.